CentralwOrld is a shopping plaza and complex in Bangkok, Thailand. It is the eleventh largest shopping complex in the world. The complex, which includes a hotel and office tower, is owned by Central Pattana. 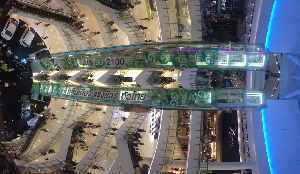 In 2006, after three years of design and renovation, CentralWorld was expanded to 550,000 square metres of shopping mall and 830,000 square metres of complex, topping nearby rival Siam Paragon in terms of size.